Live from Swaziland ... it's Saturday morning! : Will Elvis be remembered? The call was urgent, the child was suffering. The child had suffered for the whole 15-months of his life and had been in and out of the hospital many times. Why? Because he was starving to death. Baby Elvis was the 9th born child to a woman who is currently 8-months pregnant. She had been living with her husband and family until recently when the husband left, the family kicked her and the children out of the homestead and she found herself hopeless. Time and time again she asked for help, and none was given. When the child couldn’t hold up his head and he was too weak to open his eyes so she walked 20KM/12.4 miles (remember, 8-months pregnant) carrying her sick child for help. On Tuesday afternoon, Elvis came to us. I gasped when I saw his body and said, “What a mess!”. That is not usually how I describe a child who is being placed with us through Social Welfare (or any child for that matter). 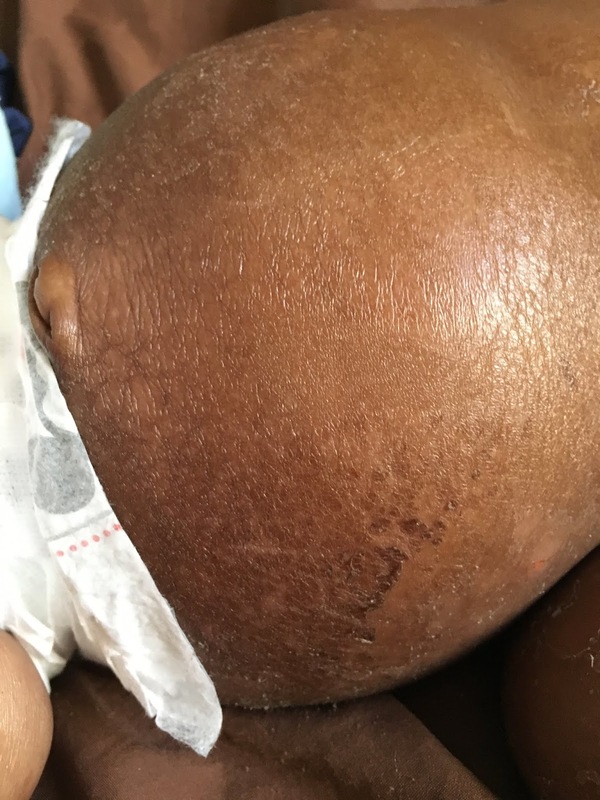 Let me describe what we saw – all signs of severe malnutrition called Kwashiorkor. His body was very fat and puffy, but that is because his body was storing fluid, putting pressure on his organs, particularly his liver and heart. His feet and hands were hot to the touch, but he didn’t have a fever. 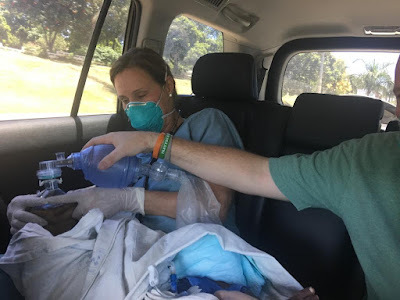 Nurse Anthony did a full assessment to find many things including his skin had split and was peeling due to the swelling from the edema, teeth were rotten and misformed, severe diaper rash, severe thrush and his whole body hurt to be touched. We followed all of our protocols and sought council from two Doctors (our pediatrician and our HIV/TB/malnutrition expert). You might think that you could just start giving him food and he would be fine, but in fact, it could be the very thing that kills him. It is called re-feeding syndrome and it was critical that we handle it properly. We made our own F75 and slowly started treatment. There was no urine or stool for many hours, and then he started vomiting. By the early morning hours his breathing became shallow and we rushed him to the hospital – me driving like a crazy person who had just lost a baby two weeks ago and Anthony closely watching the baby in the back seat. The rest of the day was long, traumatic and logic-defying. By the time we got to the hospital his legs and arms were cold. His oxygen levels were very low and he didn’t flinch when they stuck a needle in to his femoral vein to get blood. His veins had collapsed and there was no way to get an IV into him. His body was starting to shut down. Earlier that week we had a visit from some US doctors who are in the country working on Emergency Medicine training and they just “happened”* to come and visit us. Long story … I called to tell them we were losing a baby. They jumped in their car, drove 35 minutes to the hospital and ran straight in to the ER and got to work. They stuck an intraosseous needle into his thigh bone (something the nurses there had never seen) and things started to look better quickly. I knew that the boy would live (well, I thought/hoped he would live). An hour later he took another turn for the worst. I drove my truck around to the ambulance entrance, the team grabbed baby Elvis, who was now blue in the face, and ran and jumped in to the back seat of my truck with an Ambu bag, manually respirating the baby as we flew through Manzini. 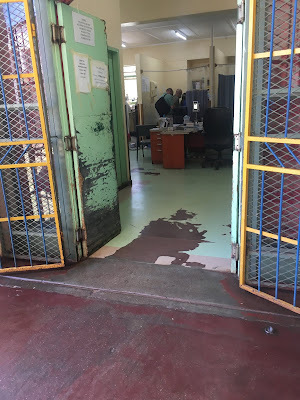 We got to the other hospital (where Doctors were waiting for us) and took him straight to ICU where FOUR US Doctors/nurses and FOUR Swazi Doctors/nurses worked to save his life. It took 50 minutes to intubate him and the machine was breathing for him so they could start working on the other issues. At 10:10PM I got the call that Elvis was dead. Something about oxygen and a blood transfusion … the rest was a blur. Two minutes later the Doctor called back to ask me to come pick up the body. What? I reminded him of the late hour, and besides, what was I to do with a dead baby?? He called again a few minutes later and kindly explained that there was nowhere for the hospital to store the body, and that I must come at once. What the what?? I refused, then suggested that they call the funeral home and have them pick the baby up. They agreed. Then I sat down and sobbed and sobbed and sobbed until I was too tired to cry anymore. It was just all too much. Starvation and malnutrition are rampant in this country and things seem to be getting worse. Add in HIV/AIDS and Tuberculosis and it’s complicates each health situation immensely. I am told by all involved that this little boy, Elvis, was at the “end of life” stage when he came to us. While we did everything possible to keep him alive, what we did the best was hold him, love him, pray for him and rock him during the night to provide comfort and peace. He was only with us for 18-hours before he was taken to the hospital. Our prayers for healing were answered, just not the way we had hoped. Maybe this was also a gift to his mother who didn’t have to watch her baby die in her arms? Elvis will be remembered by all who touched him as he touched each and everyone of us deeply. I am always reticent to put a donation link at the end of a blog like this. It somehow seems inappropriate and I don’t want to diminish the message of the blog. But at the same time, we need to pay Elvis’ hospital bill, and so many others who we care for. So, if you have read this blog and you are moved, please help us to help the next child in desperate need by making on one-time gift to our Emergency Medical Fund in the US or in Canada. I want to take a moment to give a special thank you to the MESH team from the US who came to my rescue this week. I will never forget their love, compassion and “get it done” spirit. I expect we will be friends for life. Live from eSwatini … this doesn’t get any easier. *Nothing just “happens”. One of the MESH medical team referenced is a Nurse Practitioner named Lisa. Lisa went on a medical mission trip to the Philippines after the Tacloban tsunami. Our daughter Chloe was also on a missions trip to Tacloban with her school, Morrison Academy in Taiwan, at the same time and Chloe told Lisa about what we do in eSwatini. Lisa and I became Facebook friends, and this week she came to visit. God's ways are not our ways, they are better. What if He wants to use your boat?